Lomani Lomani Do It, ElPaso, Pour Homme Pack of 3 Deodorants Lomani deodorants for men come with opening notes of bergamot & lemon playing around. Soothing sandalwood, patchouli & powdery musk lead you into a dry down that lingers on your skin for a long time. Lomani deodorants are known for quality since ages with a lingering effect they create on application. Buy Lomani deodorants online at lowest prices on DeoBazaar. Product #: Regular price: Rs.975INR589(Sale ends 01 January ) Available from: DeoBazaar.com Condition: New In stock! Order now! Explore Lomani | More Combos And Giftsets | Why shop from us? This product is sourced directly from the brand authorised channel. Lomani deodorants for men come with opening notes of bergamot & lemon playing around. Soothing sandalwood, patchouli & powdery musk lead you into a dry down that lingers on your skin for a long time. 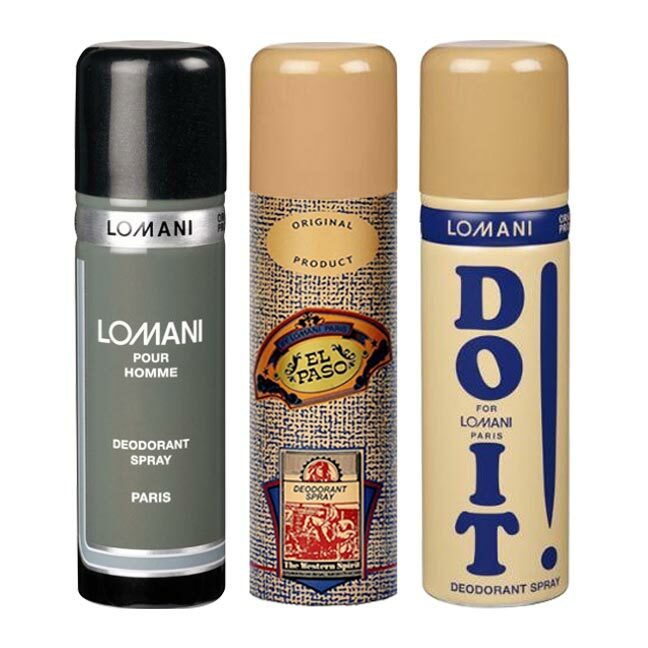 Lomani deodorants are known for quality since ages with a lingering effect they create on application. Buy Lomani deodorants online at lowest prices on DeoBazaar.